If you are caring for someone in the middle to late stages of Alzheimer’s disease or other dementia, you are not alone. Join other caregivers who understand what you are going through and benefit from a sharing of support, information, and education. In cooperation with the Eau Claire County Aging & Disability Resource Center (ADRC), The Classic will be hosting a new monthly caregiver support group to be held on the last Wednesday of the month from 1:30 – 2:45 p.m. For a listing of upcoming meeting dates, visit The Classic website at: https://www.theclassichg.com/latest/events/. Activities, social interaction, and snacks for your loved one living with dementia will be provided. Caregivers can bring their loved one to the main entrance at The Classic between 1:30-1:45 p.m. Caregivers will then separate into their own support group while loved ones will participate in activities led by The Classic staff. 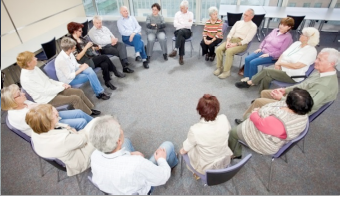 Caregivers are encouraged to participate in the support group even if their loved one is not attending. Registration is required by contacting the ADRC office at 715-839-4735.